Today’s consumers are more demanding and crave a chance to interact with a business outside of regular business hours. Your website is usually their primary starting point. An effective website design is essential to capturing the immediate interest of your online visitors. 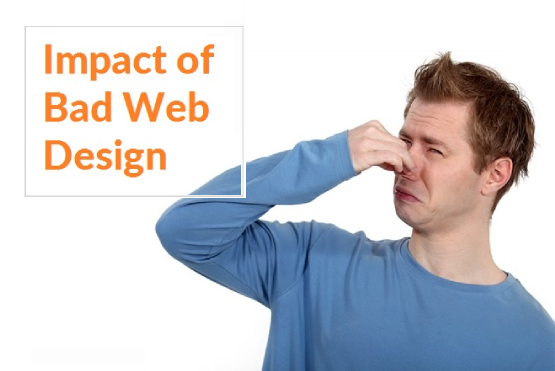 The Impact of Bad Web Design which lack visual appeal and in many cases poor functionality can be detrimental to a business. Imagine a scenario which happens every day, a very interested potential customer visits your website to find out more information about your company. They want to learn more about your business but once on your website, they become less interested and lack the confidence that your company can actually help them. Bad Web Design did just the opposite. It helped to create doubt, uncertainty and provided them with a general feeling of uneasiness about your business. In consulting with startups, we constantly stress the impact of web design and how important a strong business logo design is for brand representation. Penny Juice is a perfect example of bad web design from color palette to layout. No you haven’t gone back in time to the days of Microsoft Frontpage…this website is online and doing business in the United States. You have exactly 10 seconds to make an impression. Online visitors decide in that matter of time whether to stay on your site or leave to search for another company. In those 10 seconds, most users have decided whether they’ll stay on your website or leave. Considering that their first contact is through a website, it is essential that these users have a positive web experience. If the homepage of your website especially has bad web design, it doesn’t matter how great the remainder of your site is because the initial impression is negative. According to recent usability surveys, over 70 percent of people claim they wouldn’t buy from or use a poorly designed website. Entrepreneurs must understand that a bad website not only fails to help but is doing more to limit your overall growth potential. A well designed website can be your greatest asset. It functions as a 24 hour salesperson, marketing your business to a global audience and generating new business. If you’re concerned about how your website is representing your business, contact us to explore your options to improve your present web design.